Do you find yourself in need of a new bed for your growing child? Or, do you just want to make that small guest room seem more inviting? 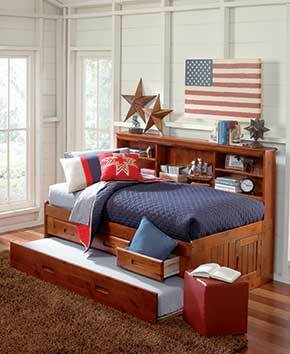 Trundle beds make terrific storage options, whether you have a large or small bedroom. Keep everything neatly tucked out of sight, and have an extra bed too! Trundle beds don’t have to just be used for kids! A storage bed is one of the best ways to have an extra spot for when an unexpected guest visits. 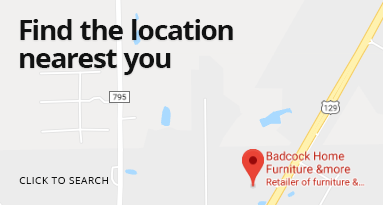 Badcock Home Furniture &more has a great selection of trundle beds to match any style. Browse our great storage bed selection online and visit your local store to find the perfect bed for your home. Need easy payments? Apply for financing online or in one of our showrooms today. This daybed gives you contemporary style with the versatility of a pullout trundle bed that’s perfect for sleepovers. It has gently sleighed arms and the back provides support for casual comfort. It’s available in dark brown PVC vinyl. Mattress not included. Get comfortable with this upholstered corner bed. Featuring a twin trundle, deeply pulled, diamond-patterned button tufting and a gorgeous pink fabric, your child will fall in love with this amazing piece.